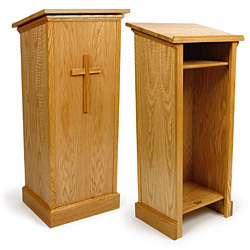 These medium oak pulpits with cross have a floor standing design that stands 45" tall. 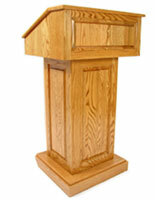 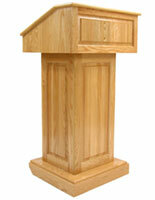 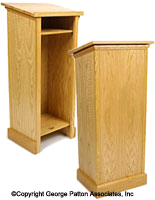 The lecterns are made from durable red oak wood and plywood and feature a neutral finish for any environment. 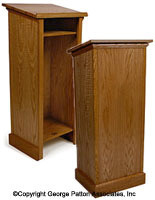 Each of the medium oak pulpits comes with an angled reading surface for holding presentation materials and an open storage shelf for keeping even more supplies. 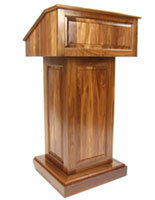 The wood podiums require minor assembly by affixing the top ledge to the frame with (4) screws. 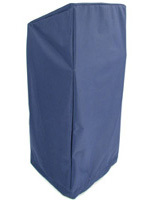 The floor standing oak pulpits with an open shelf are a great choice for churches, religious establishments and events with their 7" x 12" front mounted cross. 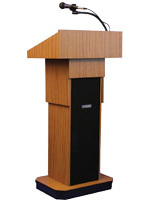 The lecterns' reading surface measures 20" x 16.3" and features a raised edge to stop books from sliding off.